See art, talk about art, walk to more art, maybe buy some art... About 110 artists in various media are participating between the 2 locations that are quite close to each other. Slim Jim & The Mad Cows are playing at Brickbottom at 6:30pm. The early evening can be pleasantly spent in an East Cambridge bar with many beers on tap and folky rock on stage from a man who's living inspirational story (and documentary). Could be interesting; I think the exhibit will many be a video of performances that have occurred during the show. It's probably be something weird. I walked by the gallery last week, and the artist has a wild look in his eyes. I said earlier this week to pick any night and enjoy, but this is the best night of this year's IPO from beginning to end. Alias "The Echo Nestival", it's the performance portion of a music-app building get-together -- with rapper El-P, funky dance-rockers Bodega Girls, and folky Faces On Film. Looks like you can get in as a listener for an eclectic line-up. "The Cover Up" does "The Last Waltz"
Did you ever see the movie about The Band's farewell concert? Some of the biggest rock stars joined them, and there were more hits than misses. 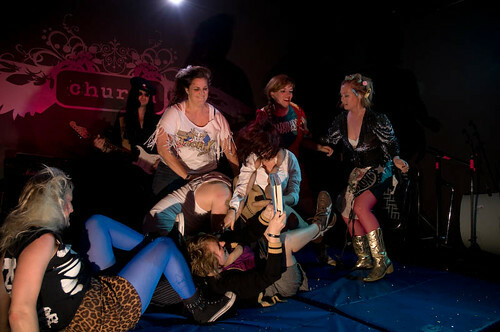 Boston League of Women Wrestlers is fun and campy. Yes, girls rock. Live bands will rock you too. Kickass rootsy rock and some really cool, classy pop-rock at my new favorite secret bar in Davis Sq.